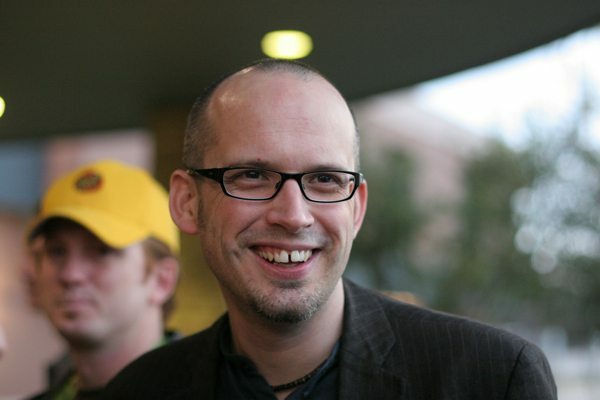 If you’ve ever considered listening to a design podcast, or stay remotely in touch with the design industry in general, you’ll have come across Paul Boag. He’s the Creative Director of Headscape, the producer of Boagworld, and lives in the heart of rural Dorset. In this interview we’ll be discussing where Paul started as a designer, which part of the job he enjoys the most, a typical “day in your life”, and how his faith affects the way he runs his business, and deals with employees and clients. Obviously there were no web courses when I studied (yes, it’s hard to believe I am that old). As a result I studied graphic design with every intention of working in print. To be honest, the vast majority of what I learned was transferable. Maybe not initially (as the web was very limiting to begin with) but over time. University taught me principles of design such as whitespace, typography, colour theory, information hierarchy and grids. However, most valuable of all, it taught me how to justify my work – a skill I use every day when talking to clients. How did your career begin in the early days, and how did you make the transition to being the Creative Director of Headscape? While at University I was fortunate enough to get a year’s placement working for IBM developing a CD-ROM for their first ever multimedia PC (a PC with a CD drive and sound card). However, while I was there, this thing called “the web” came along. Because I was the most junior member at the time and because nobody else wanted to work on something with so many restrictions, I got landed with the job. After I finished my degree I returned to IBM for three years. It was a valuable time and I learnt a lot. However, ultimately I didn’t belong in a big corporation. As the web grew in popularity, more and more of the strategic development moved to the states and I was left working with templates they delivered. In the end I left to work for a dot com startup. When I joined, the startup consisted of half a dozen people. At its height that number swelled to well over hundred. I found myself the creative lead in charge of a team of 30. However, like many dot coms, it didn’t have much in the way of a business plan. Despite raising $26 million in a public floatation it soon stumbled into financial trouble. As senior managers we tried to save the company by transforming it into a web design agency. However, at the end of the day the legacy and debt was too great and the company collapsed. That said we did attract a number of large clients, so when the company went under, myself, the sales director (Marcus Lillington) and then CEO (Chris Scott) decided to form Headscape – taking these clients with us. It was the perfect way to start, as we were profitable from month one. Which part of your job do you enjoy the most; are your roots and passion still in design, or do you prefer the challenge of running a business, writing, podcasting, and speaking? To be honest I have moved on from design. It was hard to let go but eventually your skills degrade as you are drawn into other roles. Now I love podcasting, speaking and writing. Those are where my real passion lies. I like to play with new technologies, learn new stuff and then pass that knowledge on to our team, our clients and the web design community. At the end of the day I am an enthusiast with a short attention span so my new role suits me perfectly! I like to do some design occasionally, but am nowhere as good as the amazing designers we have in house at Headscape. What is an average day? I seriously don’t have one. What I can tell you is what I did today. I woke up at about 7AM and immediately pick up my iPhone. I checked my email, checked Twitter and then read through my RSS feeds. After a quick shower I set off for the Barn (our office) which is about an hours drive for me. On the way I ate breakfast and listened to a bit of an audiobook on making ideas sticky (Made to Stick) and some of a podcast (Macbreak Weekly). 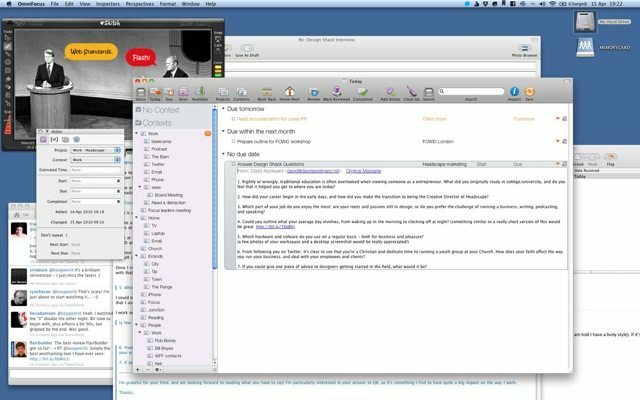 Once at work I did a Getting Things Done review in Omnifocus and lined up tasks for the day. I dealt with some email and then recorded the podcast with Marcus. After that I worked on my workshop for FOWD and sent out our monthly Headscape newsletter. The rest of the day was spent meeting and chatting with people about various projects and issues. I did a bit of wireframing with a project team and chatted with Ryan Taylor about our upcoming relaunch of Get Signoff (our design signoff tool). I could not live without my iPhone. It is constantly with me. Software I use the most is EchoFon (a Twitter app for both my Mac and iPhone), Omnifocus (my GTD task manager for both iPhone and Mac), MarsEdit that I use for blogging and Flairbuilder (a great wireframing tool I swear by). 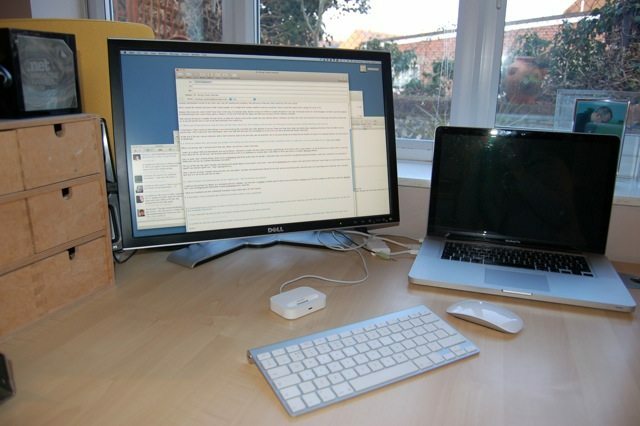 I work on a MacBook Pro with an Apple Bluetooth Keyboard, Magic Mouse, and a 28″ Dell monitor. From following you on Twitter, it’s clear to see that you’re a Christian and dedicate time to running a youth group at your Church. How does your faith affect the way you run your business, and deal with your employees and clients? The obvious and somewhat arrogant answer would be to say my faith ensures I treat clients and my staff better. However, I don’t think these characteristics are in any way unique to Christians. There are a lot of people out there who are nice! I think the impact is more subtle than that. Being part of a church has had a profound impact on who I am. I’m used to interacting socially with people from a huge variety of backgrounds – from old people to single mums. This is really useful in my job. Not only does it make usability recruiting easy no matter the demographic, it has also helped me understand and empathise with a great number of different people. I think that many web designers spend so much of their time in their own little sub culture they forget how other people live. They certainly forget how little most people know or care about the web. Being part of a church ensures you never forget! Also, churches have always encouraged me to speak publicly from the front. From a very early age I lead services and gave sermons. Also, I hear great public speakers every week. Outside of the church we don’t get to hear many good orators these days. This has a huge impact on my speaking style. Finally my faith informs my outlook on life. That includes running a business. I work to live, rather than living to work. I believe Headscape exists to enable myself and my employees to enjoy life. It should not be our lives! It has also taught me patience and tolerance – skills you need a lot when dealing with clients and users. If you could give one piece of advice to designers getting started in the field, what would it be? Get excited about what you do. Let it be your passion and your hobby. Don’t just do your job but learn to play with the web. Have side projects, read books, get engaged. As I said I am enthusiastic about my job and I think that has carried me just as far as my skills. A big thank you to Paul for taking the time to answer our questions. If you’d like to find out more about him, I’d recommend checking out his blog, or following him on Twitter.